Every morning, about an hour before there was enough light to get up, something would wake me – maybe an early-rising bird, a breeze, or the first glow of dawn – and I would not know where I was. I was just ears and eyes. 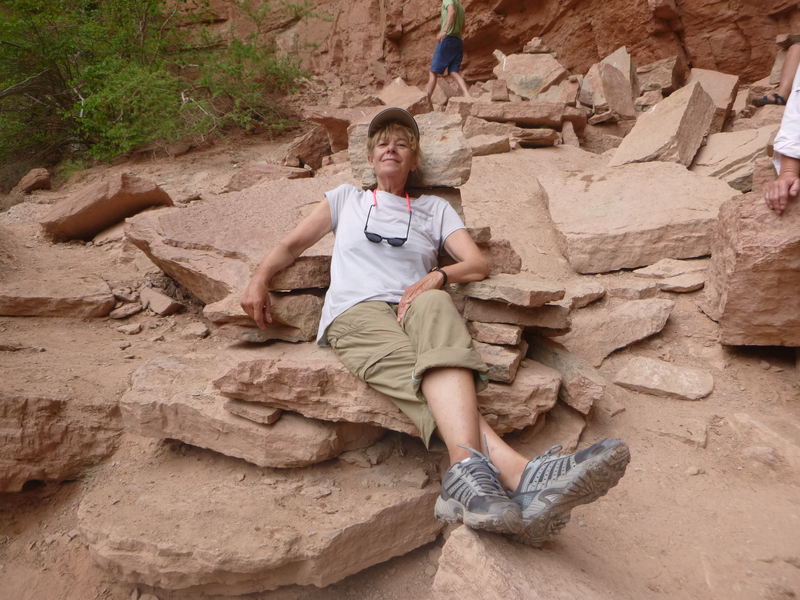 I would hear running water and see stars in a deep desert sky, and a half-second later it would register that I was lying next to the Colorado River in the Grand Canyon. Those were delicious moments. It was blessedly cool, and so quiet. I would sink back into a light sleep, and the rocks and the river would mix into my dreams. We pushed off around 8:30am. Pete and Rod told us that we would not face any serious rapids today, which was good, because several of us had over-indulged the night before and were not feeling particularly sharp. It was another case of meekness conferring advantage. After a day on the river, two drinks would make Tania and I so sleepy that we started counting the minutes before we could crawl off to bed. When it came to pleasure-seeking, we usually chose falling asleep. 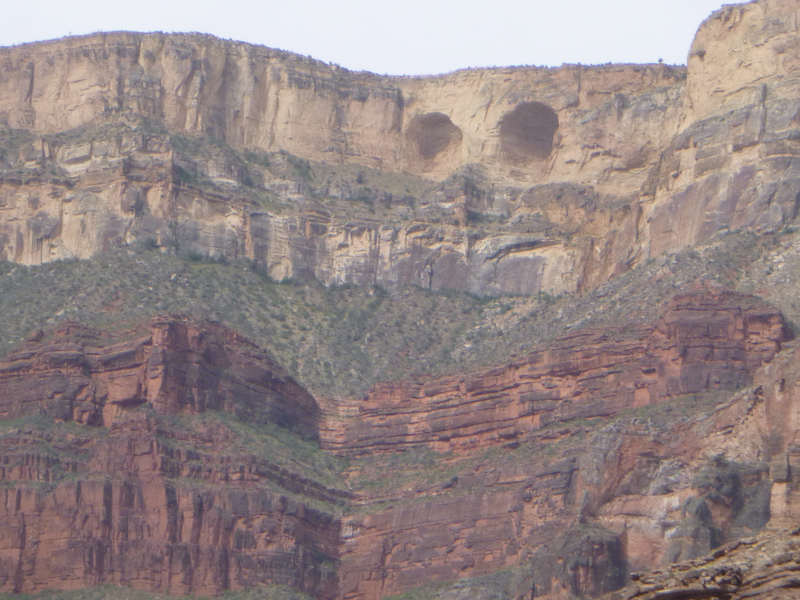 Our camp was named for a rock formation called Owl Eyes, and there they were — two caves high in the cliff face on river left. We cruised past them and entered the Granite Narrows, where at one point the river is only 76 feet from one side to the other, and more than 100 feet deep. Although the surface of the water is smooth, the currents here are strong and unpredictable. One raft would spin into an eddy while another, perhaps just a few feet away, would catch the current and sail right through. The better the person at the oars read the river, the less work they did. But nobody got it right every time. 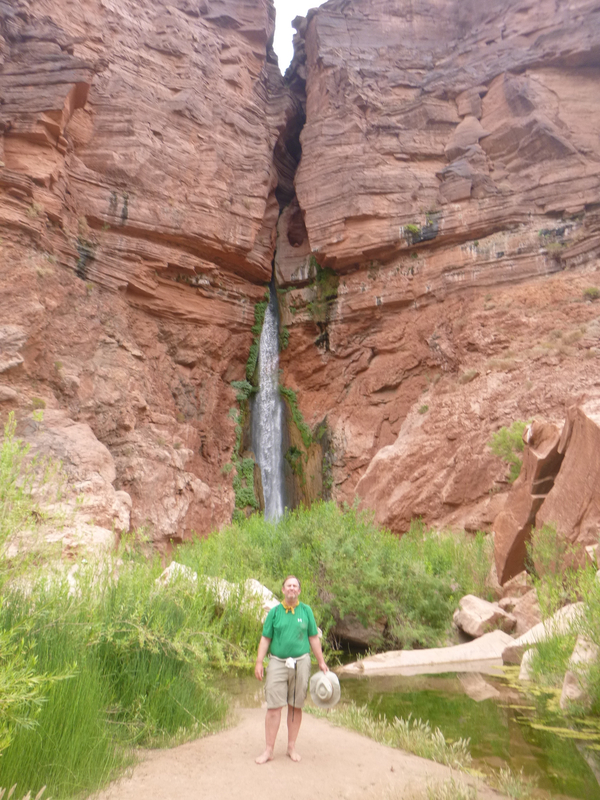 We pulled over just two miles downstream to go on our longest hike of the trip, up Deer Creek Canyon. 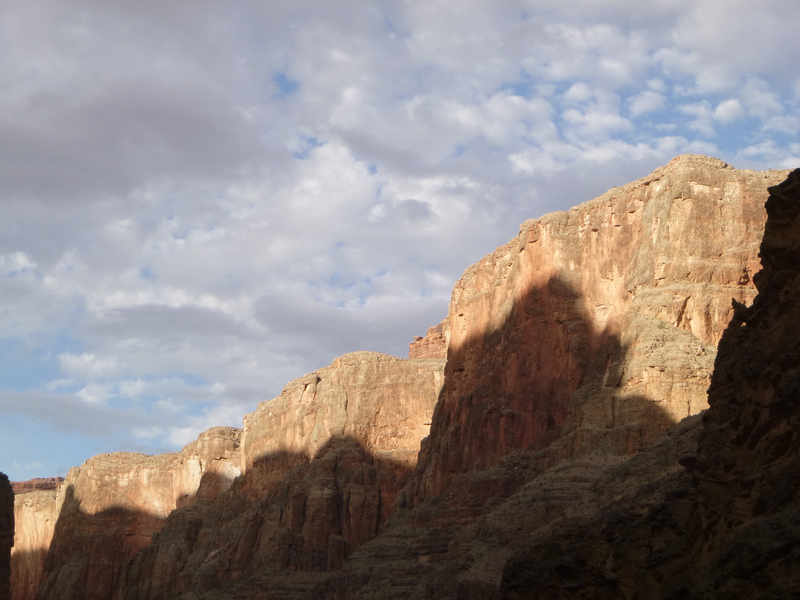 As the sun crept down the cliff face, it became clear that we had caught a break. The sky was covered with mackerel clouds. Rod said that we could be witnessing the start of the “monsoon season” in Arizona, when summer heat draws in moisture from the Gulf of California and releases it as thunderstorms. We had been away from the media for 11 days, so we had no idea what kind of weather was in store. But the clouds cut the sun and dropped the temperature a few welcome degrees. stopped, which explained the 200-foot drop at river’s edge. 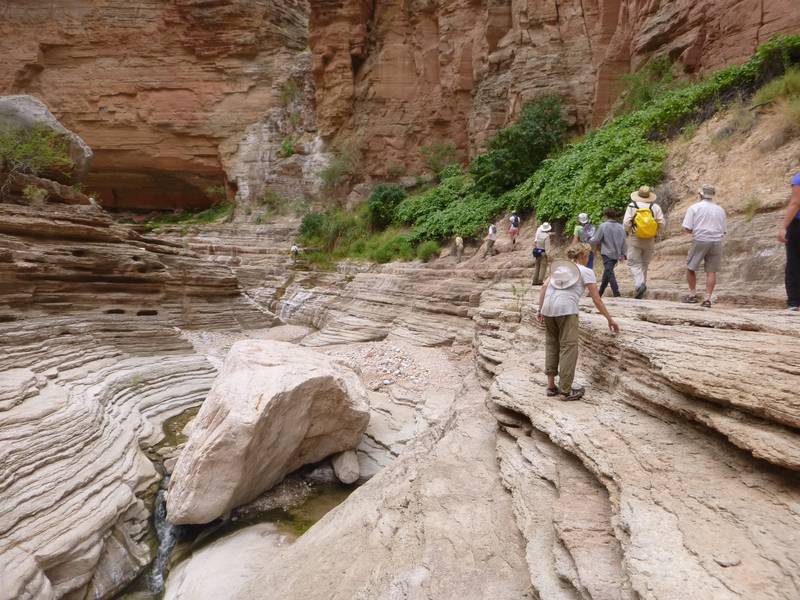 At the top of the sandstone, perhaps 500 feet above the river, we tiptoed past a vertigo-inducing cliff, then followed Deer Creek along the top of a slot canyon that was about ten feet across and hundreds of feet deep. 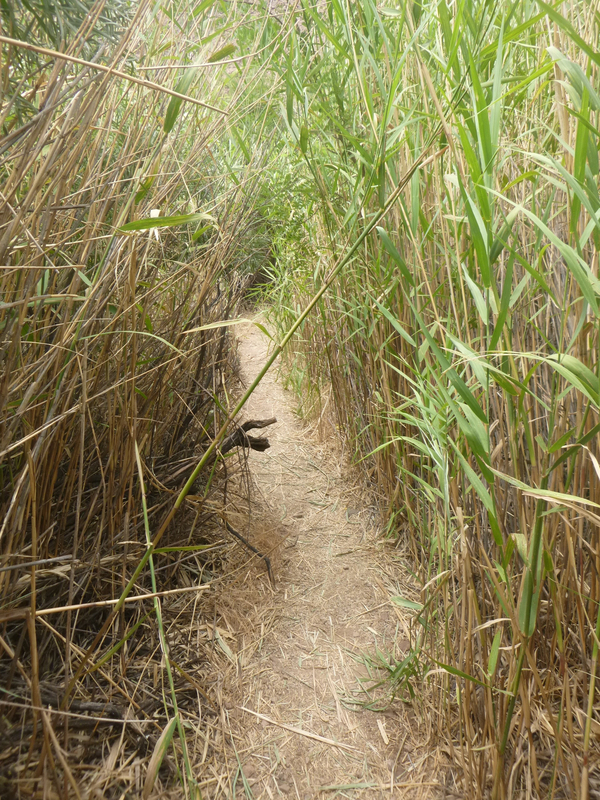 The trail was so narrow and close to the edge of this trench that Mel turned back, and I could understand why. The rest of us kept going because it looked like something good might happen at the top of the slot canyon. And it did. 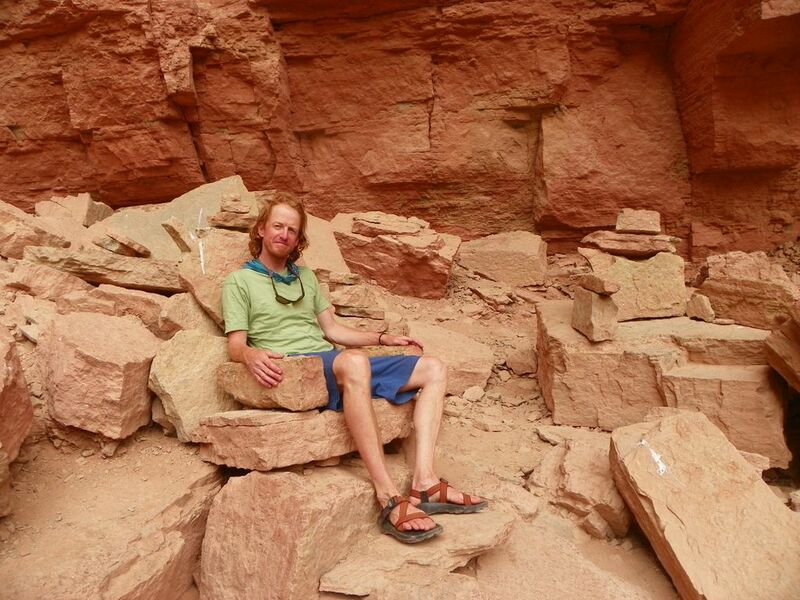 When the water reached the top of the sandstone layer, it widened into a broad, flat expanse Peter called “The Patio.” Watercress grew at the edge of the stream and there were pools to lounge in, but unfortunately, a commercial tour was already lounging. So we kept moving upstream. 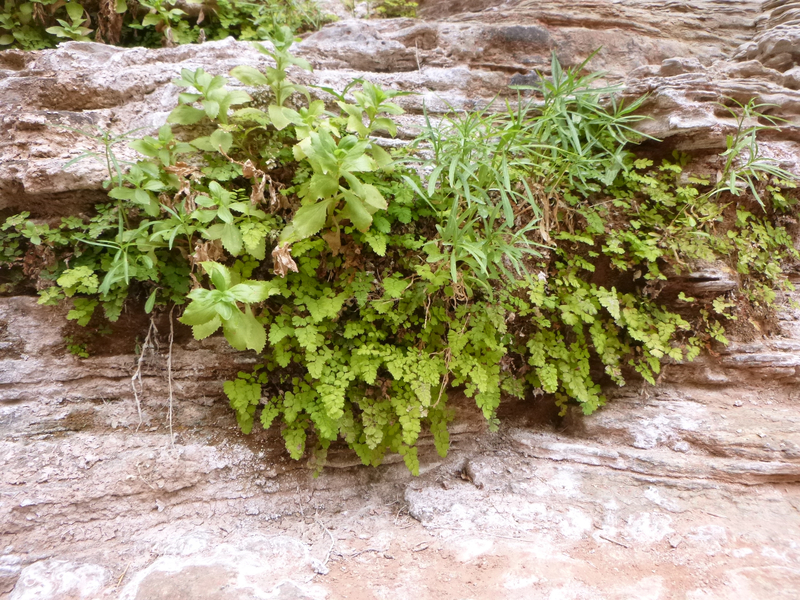 Our destination was the source of the perennial Deer Creek — a spring in the western cliff face, about two miles away. The Deer Creek basin is a full-blown oasis. A quarter-mile away from the water is too arid to grow anything but cactus and mesquite. But when you add water, the desert plants crowd in, insects buzz, animal signs are abundant, and there is enough shade and cool humidity to make a summer midday feel almost pleasant. 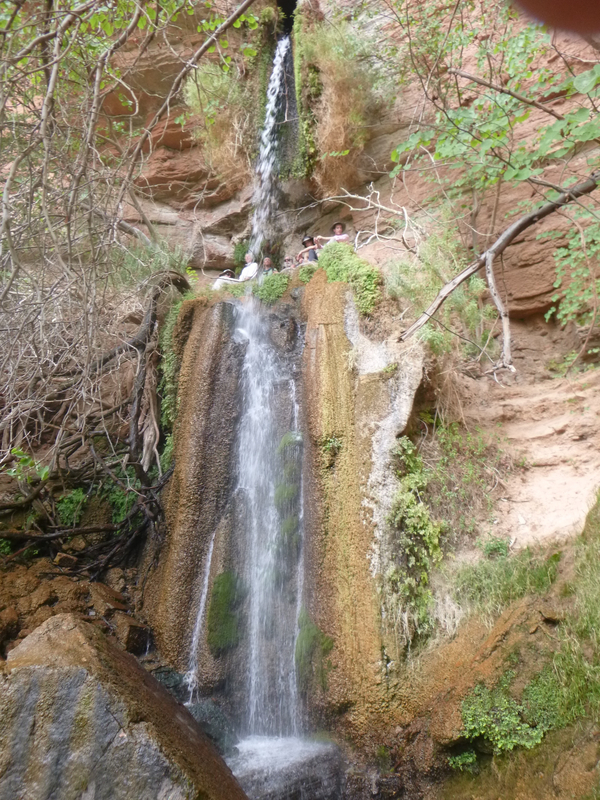 Desert creeks are restful, secret places. Thousands of of hikers probably pass through Deer Creek every year, but it looked to me that the flora and fauna here were thriving. Just below the spring was another, smaller waterfall that had a small room behind it and a plunge pool below big enough to stand in. 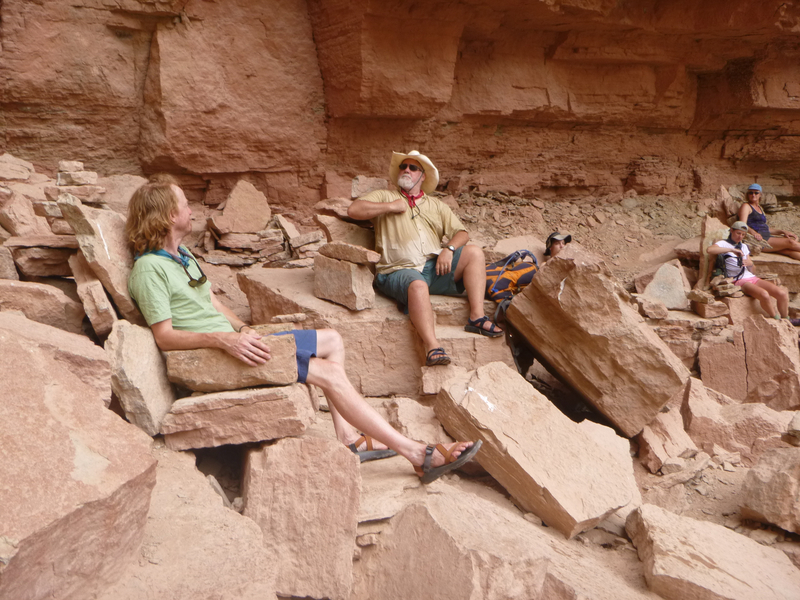 The main attraction here was the Throne Room, a rockfall where playful hikers had arranged sandstone slabs to make tables and chairs Rod said that the National Parks rangers initially dismantled the thrones whenever they found them, but that they gave up after a while. So we sat together, enjoyed the view (see photo at top), and posed for regal portraits. 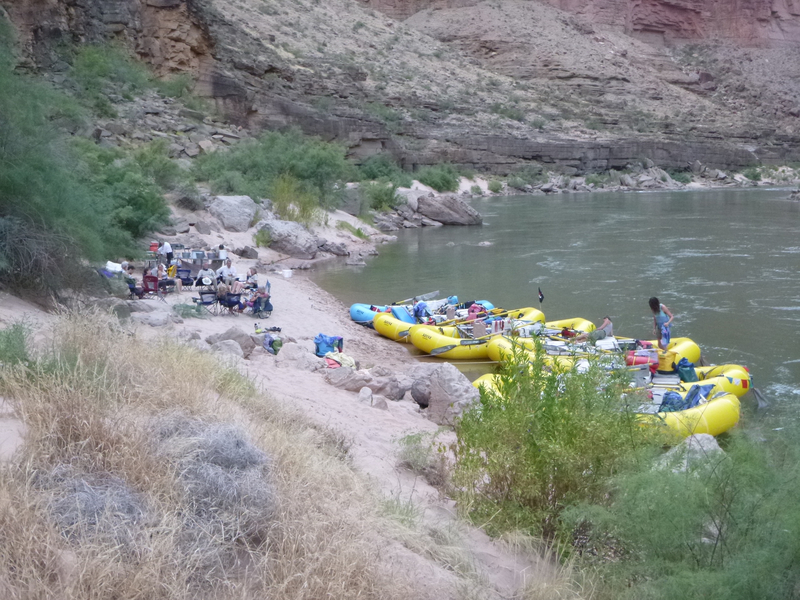 We returned to the rafts at 12:30 pm and rowed hard for the next stop, Matkatamiba Canyon. It was eleven miles downstream and, according to Pete, a can’t-miss stop. Pedro let me take the oars, and about three miles downriver the rocks changed – we left the Middle Granite gorge and went into the Muav Gorge, where the dominant layers are redwall limestone (back for an encore appearance) and whitish dolomites. The river channel continued narrow and swift-flowing, so the miles went by quickly. Tania and I entertained ourselves by making up names for what we were seeing – I wrote down the best ones she came up with, such as “melty camel face ice cream rock” – while Pedro dozed in the back of the raft. When the conversation lapsed, I entertained myself by looking ahead and trying to figure out where the current was. I was right most of the time. When I was wrong, the penalty was a few hard strokes on the oars. Two hours after Deer Creek we passed Kanab Creek, a large drainage on river right that was an important point of entry and exit in the days before the park. 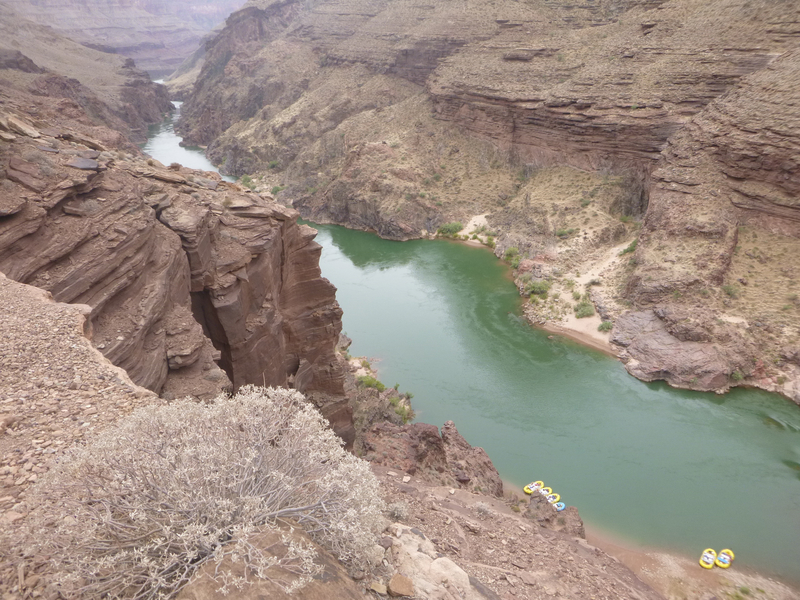 This is where John Wesley Powell ended his second, more successful trip through Grand Canyon. The first time, his party endured several capsized boats and lost much of their food and surveying equipment. The second time, he managed to make photographs and survey the river. 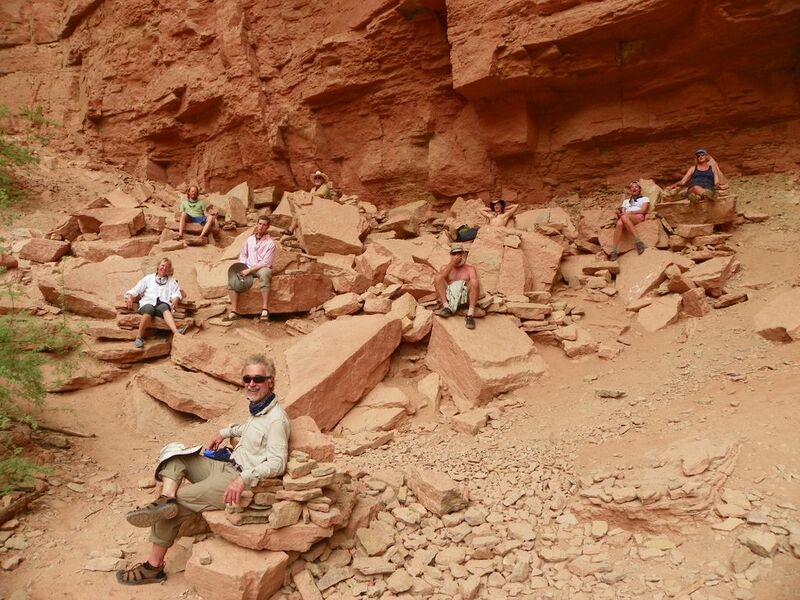 At Kanab Canyon, they left their boats, packed the most essential equipment and enough supplies for a 100-mile march, and walked back to their base at Kanab, Utah. 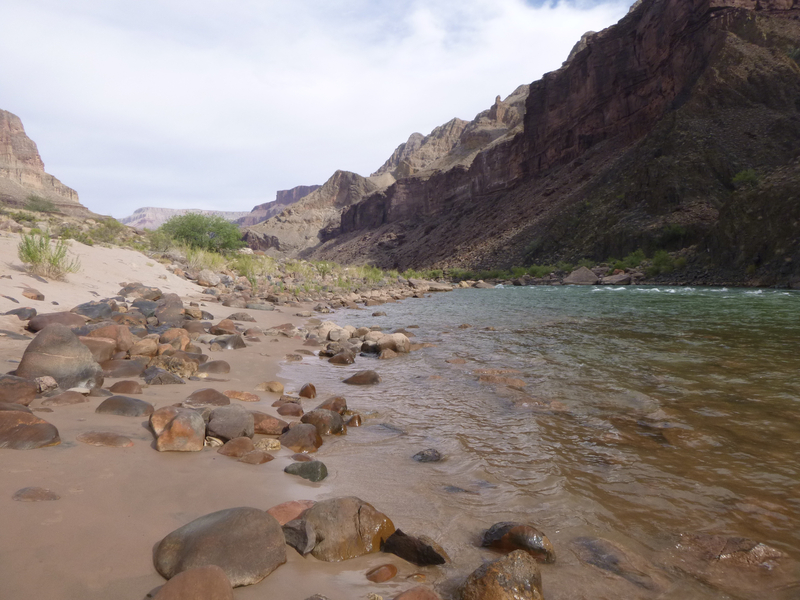 Kanab Creek is prone to flash floods, and over the years the debris from those floods has created one of the longest rapids in Grand Canyon. It is an eighteen-foot drop that unfolds steadily over several hundred yards of white water, with no serious holes or chutes to get in the way of the fun. Another hour and we pulled into Matkatamiba, a side canyon on river left that offered less water, but also less climbing. I asked my fellow travelers what the word meant, and no one knew. So when I was writing this post I asked the internet, and received more confirmation that river guides are entertaining but unreliable sources. 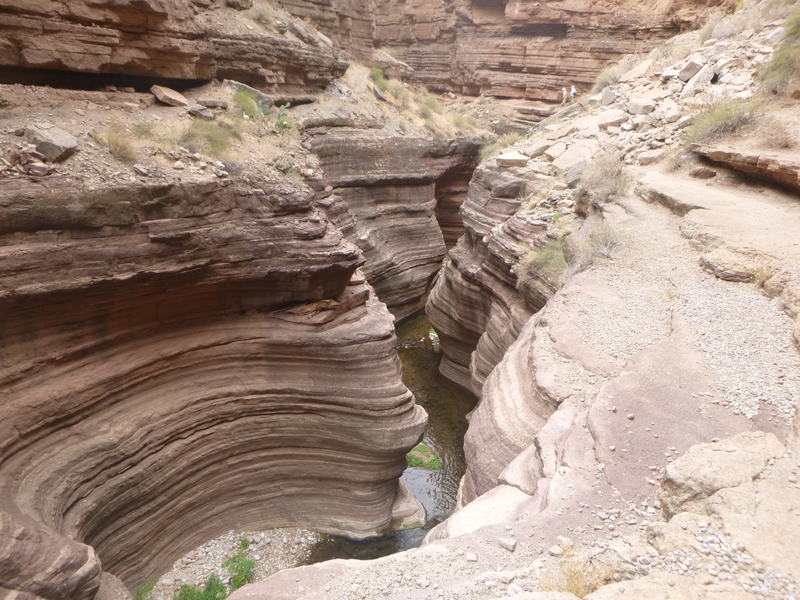 Mat-Kat was indeed beautiful, broad and flat-bottomed and scoured by periodic flash floods. But I think Pete, Christie, Jim, and Mel wanted to come back here because their expedition had faced a crisis here three years ago. Their trip leader had slipped on the rock and gone down hard on his ankle, breaking it and instantly throwing the rest of the journey into question. 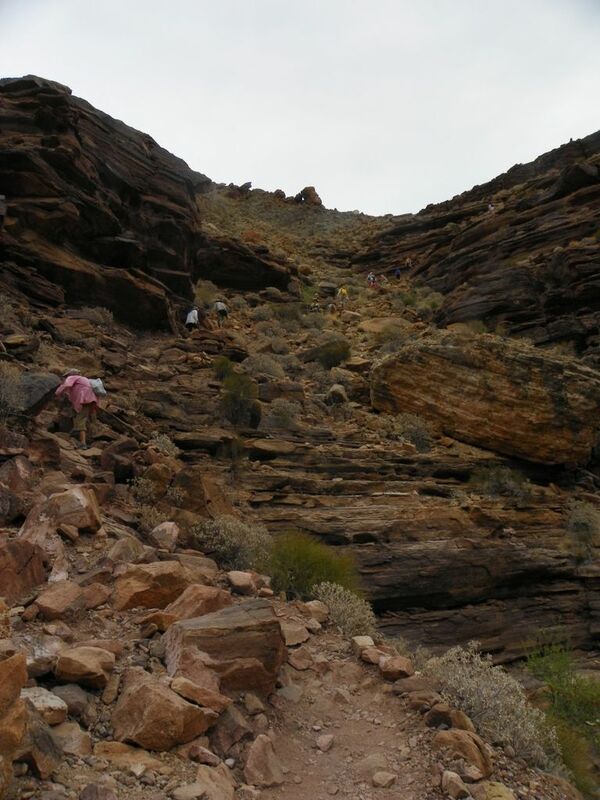 He had been injured above the section of trail in the photograph above, which requires clambering up a shale slope and wouldn’t be at all advisable with a broken ankle. To get him down, the Kirchners rigged a “pick-off rescue” that, to me, seemed impossibly complicated. Things can go wrong in a hurry down here, and when they do, you want to be with people who know how to recover. The Kirchners got their trip leader back into his raft and floated him to a beach big enough for a helicopter to land on the next morning. 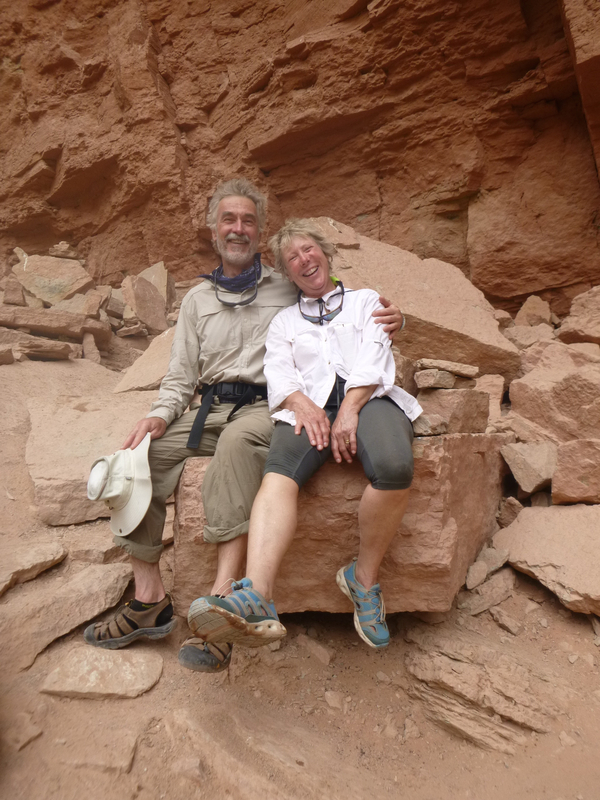 They gave him a splint and painkillers to get him through the night, and the next morning, after the chopper lifted off, they talked the other expedition members back into their rafts and prepared to run more rapids. I was lucky to be here with these people. We stopped for the night at “Mat Kat Hotel,” an exceptionally beautiful camp at the rapids just below Matkatamiba Canyon, with enough time after setting up the kitchen to enjoy the afternoon light from the luxury of full shade. Dinner was beef stroganoff, jicama salad, and Black Forest cake from the Dutch oven. It was a great, full, fun day.